The Taylor Woodrow project team at Crossrail’s Victoria Dock Portal has partnered with community interest company, Kotuku Environmental Labourer Project (KELP), to give young unemployed Londoners a helping hand into employment. 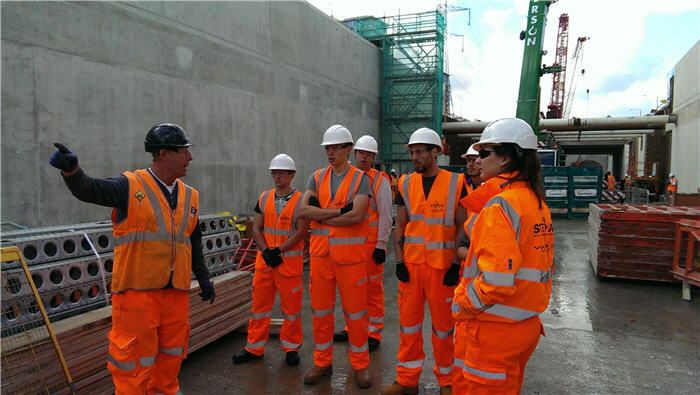 A group of young labourers from KELP spent the day with the team from Taylor Woodrow and learned about Crossrail and the Victoria Dock Portal scheme. The visitors also had a tour of the development to see first-hand the work being undertaken by the civil engineers. KELP equips unemployed Londoners with basic health and safety, environmental skills and qualifications to help give young people a kick start in building a career. Taylor Woodrow has worked with KELP in the past and knows how successful the programme can be having employed full time apprentice and former KELP Trainee, Paul Edmonds. Paul is currently based at Taylor Woodrow’s Connaught Tunnel scheme. Taylor Woodrow is constructing a 322m long tunnel at Victoria Dock in Newham that will form a ‘gateway’ into a 1km stretch of the south-eastern spur of the Crossrail route. Crossrail will serve 40 stations running from Reading in the west to Shenfield and Abbey Wood in the east. Once completed, an additional 1.5m people will be within 45 minutes of Central London.